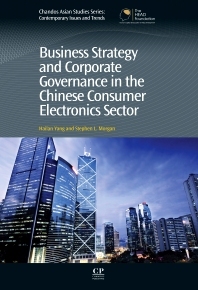 This book analyses how China’s firms in the consumer electronics (CE) sector have developed their business strategy and corporate governance during the reform process. The CE sector is one of China’s most important and dynamic manufacturing sectors. As one of the earliest market-oriented sectors after 1978, its experience illustrates the adoption of the Western model of management in China. This is the first book to analyse the link between business strategy, corporate governance and performance of firms, explicitly comparing state-, collective-, and privately-owned firms. This book argues that the competitive dynamics of the market are central to the survival of firms in contemporary China. Dr. Hailan Yang is a Lecturer in business school of Shandong Jianzhu University, China. Her research focuses on the impact of cultural, social and economic changes on China’s companies. Yang has more than 10 years of research experience in China, Britain and Australia. Dr. Stephen Morgan is Research Director of the School of Contemporary Chinese Studies at the University of Nottingham, UK. His research on China spans historical and contemporary economic and business topics.